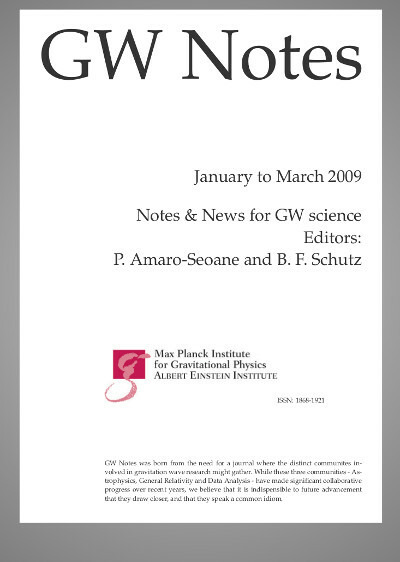 In 2009, Bernard F. Schutz and Pau Amaro-Seoane created the refereed electronic journal “Gravitational Waves Notes”. The journal is born from the need for a journal where the distinct communites involved in gravitation wave research might gather. While these three communities – Astrophysics, General Relativity and Data Analysis – have made significant collaborative progress over recent years, we believe that it is indispensable to future advancement that they draw closer, and that they speak a common idiom. The aim of the journal is to offer scientist of the Gravitational Wave community the opportunity to more easily follow advances in Astrophysics, General Relativity and Data Analysis. We we offer a new full article in each issue. This “feature article” is from the fields of Astrophysics, General Relativity or the Data Analysis of gravitational waves. Initially we also included in the journal the most significant e-prints and published them in abstract form with a link to the full paper, but this is only so up to issue #5. The drawing of Bernard and Pau is by Matt Benacquista. These are direct links to the PDFs.